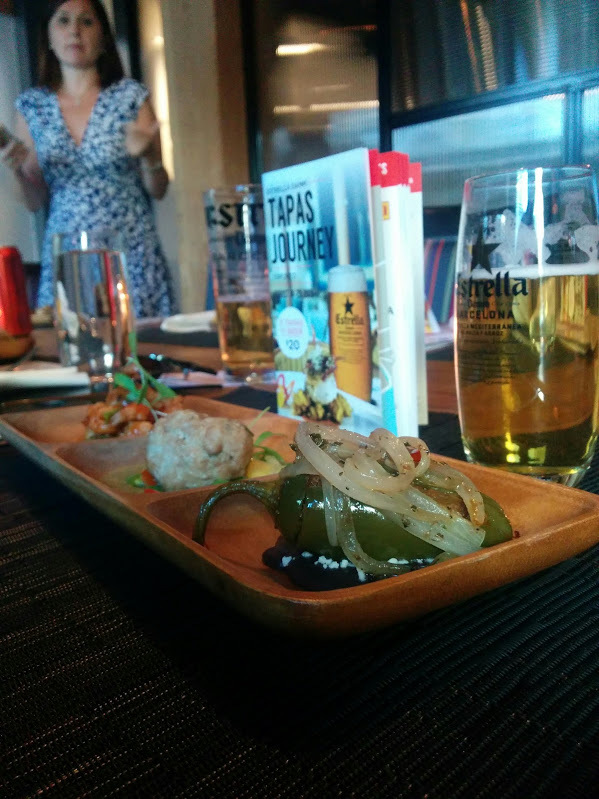 Between August 14-23, Estrella Damm beer is partnering with 20 awesome restaurants in downtown Toronto for the “Tapas Journey.” Each of these restaurants will be featuring a special Tapas Journey menu with 3 signature tapas dishes. 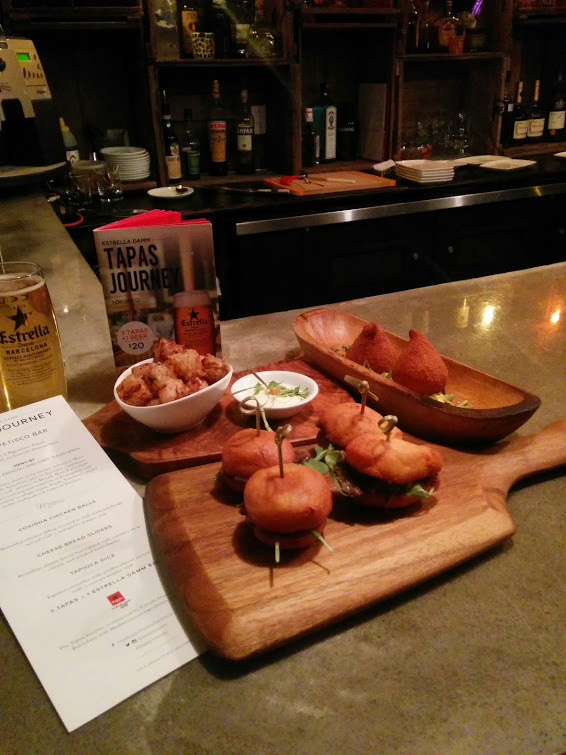 For $20, you get three tapas dishes and a pint of Estrella Damm beer too! For a fun night, pick three of the restaurants that are close to each other and order the Tapas Journey deal at each restaurant. 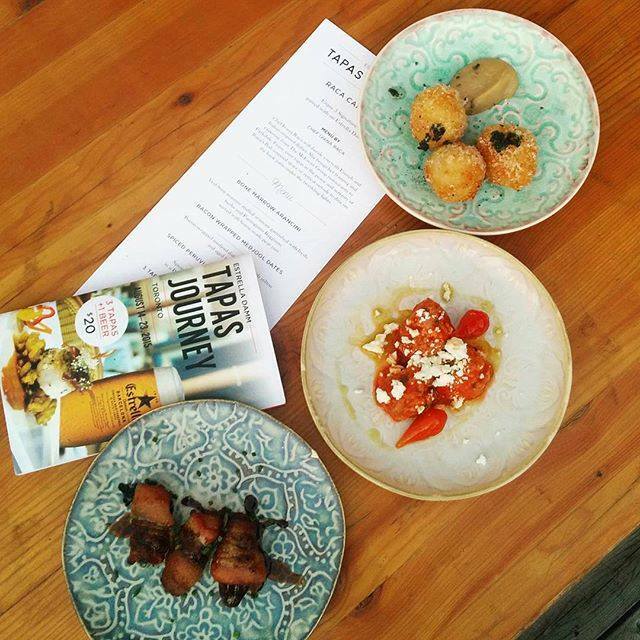 I had the chance to check out the Tapas Journey menus at three restaurants: Los Colibris, Raca Cafe and Bar, Mata Petisco Bar. The food was creative, delicious and portions were quite generous for $20. I met up with a few of my Instagram friends (@bluntfoodreview, @doctornom, @hypebelly) at Los Colibris, an upscale Mexican restaurant at King West. We had a few extra Estrella beers there after the tapas meal and then headed over to parkdale to visit Raca Bar and Cafe for some of Chef Ivana Raca’s delicious creations. Raca had a beautiful outdoor patio in the back where we enjoyed more tapas and beer. Our final stop was the nearby Mata Petisco bar, a South American spot with the largest portions of the night! One of their tapas dishes was a plate of 4 cheese bread sliders! Check out everything we ate at these 3 spots. Beer is the perfect pairing with these small savoury dishes and a full pint of Estrella Damm Beer is included in the menu! Estrella Damm is also giving away 3 trips to Miami to attend the Estrella Damm Gastronomy Congress and meet Chef Ferran Adrià. Contest details at end of article. Jalapeno Relleno- Picadillo-stuffed pickled jalapeno made with 32 different ingredients including pork, nuts, seeds, dry fruits, aromatic spices, herbs. A dish with a crazy amount of flavour! Camarones A La Diabla- Corn puree, guajillo/arbol adobo, avocado, shrimp, grilled corn. Bone Marrow Arancini- Veal bone marrow stuffed arancini garnished with fresh herbs and Parmigianno Reggiano served with house-made pear jam. WOW! Bone marrow inside crispy rice balls pairs nice with the pear jam. Cheese Bread Sliders- Brazilian cheese bread bun topped with catupiry-style cheese and smoked beef cheeks. Huge portions and a totally gluten free slider as the cheese bun is made with Cassava flour! 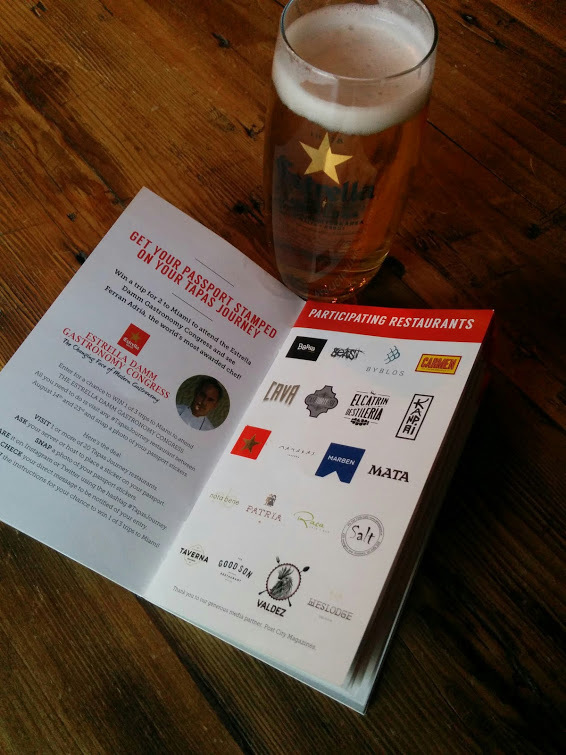 Estrella Damm beer is giving away 3 trips to Miami, where winners will attend the Estrella Damm Gastronomy Congress and see Chef Ferran Adrià. For a chance to win, you need to visit any #TapasJourney restaurant between August 14th and 23rd and snap a photo of your passport stickers. You can ask your server for a Tapas Journey passport and they will give you a sticker when you order the #TapasJourney menu. Full contest details here.